The courage to love the unlovable is something that I have struggled with many times. You see, Gregg & I work with many different ethnic groups, many different economic levels with our ministry and loving the unlovable (in some eyes) have never been hard for me. I struggle with people that are in my walks of life as being my unloveable. My unlovable is someone that looks like me and talks like me. You see, I have spent so many years loving, I mean genuinely loving, students that don’t have the cheering squads behind them or have family trees that look like a thorn bush. My heart is full of love for the people strive to make their lives better and have every chip stacked against them. I know many would call this the unlovable in the community. My “unloveable” are people that look, walk, talk and act like me. I struggle with resentment for people that sit in their homes with their families and don’t reach out to others. They take care of their own and no other. But show up on Sunday mornings to church and have not served Christ or His people throughout the week. This is the “unlovable” that I struggle with. I am just as much in the wrong as the one that struggles loving people that are different than them. Jen Schmidt’s book Just Open the Door will launch in April. You can pre-order on Amazon. Don’t let this one slip by. You need first to recognize and admit your struggle to love a particular people group or demographic. There is not a single human being on this earth that doesn’t struggle with this. I promise you. You might have someone tell you; I love everyone. It is so not right. They struggle just like I do. Dwell on your thoughts that you have had over the past week. You should have plenty to think over. With all the school shootings happening, the government is in total dismay, poverty only growing more and more. There is so much that I am sure you have had a strong opinion on. My prayer is that your opinion is lining up to what God’s word teaches and that you are hating the sin but still loving the sinner. The person that holds the gun and takes a life has been consumed by evil. The husband that has a beautiful family that has been recognized as a cheater has been devastated by sin. Don’t make less of the sin, but be compassionate for the sinner. Have the heart to want to see reconciliation for the sinner. Have you heard this, Oh, I wish that person could get help? Or, Oh, bless that boy’s heart he needs someone in his life that can direct him. Have you ever thought you could be “That Person”? You are not exempt from investing in other peoples lives because you are older, a young mom, an executive, a low-income family, or the family that has kids doing way too much, so you don’t have time family. There is no exemption for us. Scripture calls us to be investing in others. 1 Thessalonians 2:8 says, “We loved you so much that we share with you not only God’s Good News but our own lives, as well.” This is a call to action. We don’t just throw the Gospel at them; we invest in them by welcoming them into our lives. Don’t make it an event to love the unlovable. Loving someone is not an event. Don’t show up at a one day mission’s day with your church and fool yourself that you fulfilled what God has called you to do. It is a starting point. There is nothing wrong with a group going and working with a mission for a day. This is a great need across all nonprofits to have people come and serve. But it doesn’t make a life change in the community or the individual. Life change in you and the others happens when you invest. If you are targeting a particular people group and do a back to school bash for them. They will love it. There is a need met by them receiving a backpack, school supplies and maybe even some items of clothing. But if you go away, there is no heart relationship happening. There is nothing other than a handout that was given. Don’t take this wrong; we need groups to meet needs like this. It is much needed. But it doesn’t fill the calling to love the unlovable. Where is your unlovable? Who do you struggle with loving? I challenge you to find that people group. Carve out time and go volunteer or invest. Mine is being part of a women’s group that I can love on, encourage and challenge. Remember, my struggle is with people like me. People that can easily say, “I am too busy to do that.” I also struggle with lazy people. So I invest in young moms that tend to become beat down and lazy and will fall into a lifestyle of allowing others to do for them what they could do for themselves. These are the two areas I invest in. Don’t stop doing mission trips and mission days with your church. They are so needed. But don’t let that fool you that you don’t need to be reaching out to love the unlovable. We are called to love. Love period. God places people in our lives, we are called to Love God and Love others. Simple. Why am I trying to make it hard? Why are you making it so hard? Let’s encourage each other. 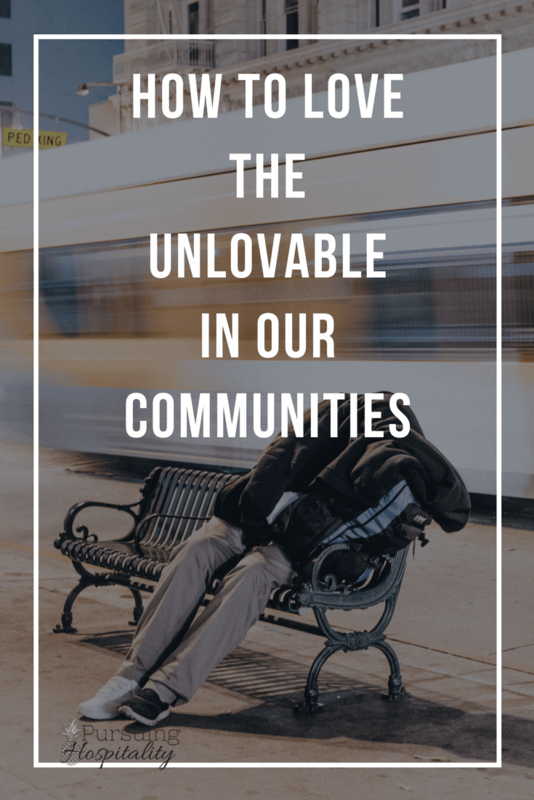 Who is your unlovable? How are you trying to overcome this and reach out to them?